Longines Mens Watch . Dispatched with Royal Mail 2nd Class. The band I'm sure is gold I tested it with a kit you can see in the picture the drop the left on the stone is 10k and the drop on the right is 14k and it stay gold color. • Engraved Case Back “La Grande Classique de Longines”, serial and model numbers. • Yellow Gold Colored Case, Not Real Gold. • Champagne Colored Dial. • Gold Colored 5 Link Bracelet. • Dark Blue Hour/Minute Hands. Longines La Grande Classique, ref. L4.708.2, mid-size automatic watch. The case of the watch is clean with few signs of normal wear. The crystal is clean and without scratches. Technically the watch is in excellent condition. La Grande Classique de Longines. Model: La Grande Classique. Designer: Longines. Dial: Textured White. Dial Markers: Dash-markers. Features: 12-Hour Dial, Easy to Read. Hands: Hour & Minute Hands. Material: Stainless Steel. The watch itself is in great used condition. Light signs or wear from daily usage over 1 - 2 years. Been sitting in the closet ever since. Still runs well. And it's always nice to have the original case, too. Rose gold PVD stainless steel case with a two-tone (silver and rose gold PVD) stainless steel bracelet. Fixed rose gold PVD stainless steel bezel. White dial with blue hands and Roman numeral hour markers. Dial Type: Analog. Longines Calibre 420 quartz movement. Scratch resistant sapphire crystal. Pull / push crown. Solid case back. Case size: 36 mm. Round case shape. Band width: 20 mm. Fold over clasp. Water resistant at 30 meters / 100 feet. Functions: hour, minute. Dress watch style. Watch label: Swiss Made. Longines La Grande Classique de Longines Ladies Watch L47551917. Silver-tone stainless steel case with a silver-tone stainless steel bracelet. Fixed silver-tone stainless steel bezel. White dial with black hands and Roman numeral hour markers. Dial Type: Analog. Longines Calibre L591 automatic movement with a 40-hour power reserve. Scratch resistant sapphire crystal. Pull / push crown. Transparent case back. Round case shape, case size: 36 mm, case thickness: 8 mm. Band width: 20 mm. Deployment with push button release clasp. Water resistant at 30 meters / 100 feet. Functions: hour, minute. Additional Info: powered by everyday movement of your arm. Casual watch style. Watch label: Swiss. Longines La Grande Classique de Longines Automatic Men's Watch L49084116. Stainless steel case with a black (alligator) leather strap. Fixed stainless steel bezel. White dial with black hands and Roman numeral hour markers. Dial Type: Analog. Longines calibre L591 automatic movement with a 40-hour power reserve. Scratch resistant sapphire crystal. Pull / push crown. Transparent case back. Round case shape. Case size: 36 mm. Band width: 20 mm. Tang clasp. Water resistant at 30 meters / 100 feet. Functions: hour, minute. Dress watch style. Watch label: Swiss Made. Longines La Grande Classique Automatic White Dial Ladies Watch L4.908.4.11.2. Stainless steel case with a black leather strap. Fixed stainless steel bezel. White dial with black hands and Roman numeral hour markers. Dial Type: Analog. Quartz movement. Scratch resistant sapphire crystal. Pull / push crown. Solid case back. Case diameter: 37 mm. Case thickness: 5 mm. Round case shape. Band width: 20.3 mm. Band length: 8 inches. Tang clasp. Water resistant at 30 meters / 100 feet. Functions: hour, minute. Dress watch style. Watch label: Swiss Made. Item Variations: L4 766 4 11 2, L4-766-4-11-2, L4/766/4/11/2, L47664112. Longines La Grande Classique White Dial Black Leather Watch L4.766.4.11.2. Stainless steel case with a black (alligator) leather strap. Fixed stainless steel bezel. White dial with black hands and Roman numeral hour markers. Dial Type: Analog. Swiss quartz movement. Scratch resistant sapphire crystal. Pull / push crown. Solid case back. Case diameter: 36 mm. Case thickness: 6 mm. Round case shape. Band width: 20 mm. Tang clasp. Water resistant at 50 meters / 165 feet. Functions: hour, minute. Dress watch style. 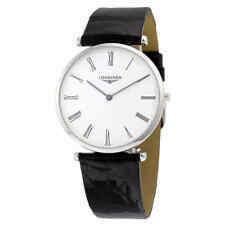 Longines La Grande Classique White Dial Black Leather Ladies Watch L47554112. Classic La Grande Classique de Longines Steel Bracelet Quartz Watch L4.205.4. Case width: 22mm excluding watch crown. No box or paper work. In excellent working order. New battery. Light scratches to the case. Longines La Grande Classique Watch L49084116. Longines watches. Dial Color: White. Watch Warehouse Certificate of. Why choose Watch Warehouse?. Our office is located at the International Jewelry Center. La Grande Classique. Longines Calibre L209. WATCH LABEL. Hour, Minute. PRODUCT CATEGORY. L4 209 4 11 2, L4-209-4-11-2, L4/209/4/11/2, L42094112. ITEM VARIATION. INTERNAL ID. Longines watches. Watch Warehouse Certificate of. Why choose Watch Warehouse?. Bracelet/Strap: Leather ( Black ). 2 year WatchWarehouse Warranty on all watches. We do not share your information. Why WatchWarehouse. Black Dial Set with Diamonds. - 12 Diamonds Set On Dial (.048ct). - Scratch Resistant Sapphire Crystal. If the watch would ever need service, you would send the watch to us. WATCH INFORMATION. - Black Leather Strap with Alligator Pattern. Longines La Grande Classique Watch L49082117. Longines watches. Watch Warehouse Certificate of. Why choose Watch Warehouse?. Bracelet/Strap: Stainless Steel, Two Toned, Yellow Gold and Silver. TW Steel watches. This Magnificent Longines Stainless Steel La Grande Classique model # L4.709.4.11.6 will make a perfect gift or a great addition to your collection. Two Year Limited Warranty. Stunning item, authentic LONGINES "La Grande Classique ". Stainless steel. Model L4 7094 SERIAL 32526156 . Round face, white color. Roman numbers. The watch is priced for a quick sale. Longines La Grande Classique Ladies Quartz Wristwatch L4.209.4. Excellent Clean Condition. Crystal and Dial are in Nearmint Condition with no scratches. Really Nice Watch. Longines La Grande Classique de Diamond Watch D Color Diamonds L42410. The quality of this job is way behind what I have seen on a Longines. Total Gross Weight : 19.5 grams. Magnificent set diamonds set top notch on the star facets. • Glass : Scratch-resistant sapphire crystal. AUTHENTIC LONGINES LA GRANDE CLASSIQUE SS MEN'S L4 7094 32526156. Stunning item. Model L4 7094, serial 32526156, rounds face ( white color ). The item is in very good looking and working condition. We also have a matching pair for this watch. Ladies Longines. Rose gold PVD stainless steel case with a two-tone (silver and rose gold PVD) stainless steel bracelet. Fixed rose gold PVD stainless steel bezel. Dial Type: Analog. Scratch resistant sapphire crystal. Case Diamonds: Case set with 48 Top Wesselton IF-WS diamonds, for a total of 0.403 carats. Gorgeous diamonds on case surround and hour index. Diamonds: Dial set with12 Top Wesselton VS-SI diamonds, for a total of 0.034 carats. Stainless steel case with a stainless steel bracelet. Fixed stainless steel bezel. Dial Type: Analog. Scratch resistant sapphire crystal. Pull / push crown. Transparent case back. Case size: 36 mm. longines la grande classique Condition is Pre-owned. Shipped with USPS Parcel Select Ground. La Grande Classique de Longines for men , in excellent condition. La Grande Classique de Longines for men , in excellent condition. . Condition is Pre-owned. Shipped with -. Case; gold plated in excellent - mint condition. Dial; original, in excellent - mint condition. Hands - Crown ; original, excellent condition. I try to describe the item with accuracy and seriousness; I am human and do make an occasional mistake and I would like the chance to correct it. This is a beautiful wristwatch - Les Grandes classiques de Longines. Model L5 - 131 - 2. Material : stainles steel and gold plated. From the warranty of this watch is seen that was bought in 1998. LA Grande Classique model with bi-coloured bracelet. For sale is this amazing and fabulous Longines wristwatch. This is an opportunity to own a unique Longines watch at a fraction of the price. £15 Worldwide. Longines L4.705.4.12.2 La Grande Classique Tonneau 30 Stainless Steel. Longines La Grande Classique De Longines. Series La Grande Classique De Longines. It began producing varied designs of high caliber that ensured better quality and performance. Identified through its winged hourglass logo, it is now present across 140 nations in the world, reflecting elegance and attitude. Longines La Grande Classique Ladies Bracelet Watch. Gold Plated. Box and Papers. Ladies la grande classique de longines slim bracelet watch. Overall good condition with a small amount of rubbing to the bracelet. The width of the watch case is 24mm. The watch has a scratch proof sapphire crystal along with a white roman dial. · SERIES La Grande Classique de Longines. · ENGINE Longines Calibre L420. Note: Watch box not included. Just the watch. · GENDER Ladies. · BAND COLOUR(S) Silver Tone. For sale authentic Longines, gold plated, in good condition, without original box, with card. Reference Number: L4.709.2. Case Size: 33 mm. Longines La Grande Classique. Price £1180. 33mm Quartz Watch. Longines La Grande Classique de Longines diamond and mother of pearl watch. The band color is silver and the case material is stainless steel. The size of the case is 24mm. The shape of the watch is round and is in the luxury style.